Or 5 for 15 now that I think about it. Not bad. I don’t mind grinding if there is a light at the end of the tunnel but earning 100 zen coins for each table is gonna take forever. I definitely think I can get everything to 3 star by grinding but 4 star is going to be crazy. I had thought about just buying the games from the beginning but that would be something like $10 a game. Which I find ridiculous quite frankly. But if I get everything to 3 starts and buy 150 coins for 4.99 then it’s essentially 3 games for $10. And that is much more reasonable to me. Not great to have to grind and pay but the grinding is kinda fun. If I hadn't wasted approx 11000 tickets playing League Mode I'd have almost every table at 3 stars (Just need one more ToM part to drop!). Estimated tickets earned - 55000 (that's £50 worth if purchased from the store). I've only spent coins on features and still don't have any grade 4 tables. Wish Android logged total time played as that would be an interesting figure, suffice to say it has been substantial. Unfortunately XP level can't be used as a rough indicator as it's nonlinear, it takes me ages to level up! But if I get everything to 3 starts and buy 150 coins for 4.99 then it’s essentially 3 games for $10. This is not a bad way to look at it - another option is to earn 50 coins through challenges then pay 4.99 to complete the upgrade of two tables. More palatable. The major kick in the nuts is that all that effort basically rewards you with the opportunity to purchase tables at prices comparable to other formats. The only real benefit taking the grind route is that you can selectively choose which tables you really want. There may be compelling discounts later in the year, I'd probably snap a few tables up. As it stands I require just 30 more coins for Pro Physics and I'm pretty much done for now, any future coin earnings can be used for a few Grade 4 promotions. The only reason I want level 4 is the offline play. After this past weekend with the servers going down it really cemented my want/need for that. Plus the free play. Sometimes I just want to play around and try and beat the challenges. Maybe that's not 'real' pinball but it's fun. I'm thinking once I catch up by buying a few tables then it won't be so bad in the future. I'm starting behind the 8 ball with all 10 tables it would take a long time to unlock them all fully. Plus we now know more are on the way soon. Gotta keep up. I’ve sent my current findings off to Zen for a response. I have an article written on how to get the most from the app, just need to wait for comment in case changes are on the way. I’m having almost as much fun with my data as I am playing the app! Kidding. Sorta. I can give you specific numbers as to how long it will take at minimum starting from scratch. It’s kinda not good. Chris has definitely mentioned it, but the challenges have (perhaps unintentionally) introduced an interesting puzzle or strategy element. I'd usually overlook modes like Survival / One Ball / 5 Minutes on other formats, at least on mobile they serve a greater purpose. I'd also agree that this 'stupid' grind process is keeping me engaged, I'm usually not that bothered or interested by reward and achievement mechanisms but it seems to apply well to pinball. If Zen resolve the issue with useless part collection, adjust gameplay timers and fix a few hardware specific issues I think I'd be satisfied moving forward. Last edited by MBeeching; 04-15-2019 at 11:38 AM. I think I have that data. It says I'm 'effed. LOL. A couple of bucks to my favorite app and I'll be current. It's all good. Can't wait for the next release batch! A bit like with some of the major Steam sales when there has been some sort of metagame - the one with the comics to get the red herring badge was interesting, can end up "playing" that, and less of the actual games until the week after! Sent a message to zen about it taking zen coins away everytime i complete a challenge and they never responded, it been about a week. What is going on is they give you the option to watch a commercial or pay 1 zen coin to get the extra two cards, when i click commercial it give a failed to connect error takes a zen coin and plays a commercial anyway. But now for the past 4 days i just get a failed to connect to server and then it starts up like i never played it before all coins and tickets are reset to 0 and it wont let me do anything. What is going on is they give you the option to watch a commercial or pay 1 zen coin to get the extra two cards, when i click commercial it give a failed to connect error takes a zen coin and plays a commercial anyway. Also, any ad that you can interact with will crash the app, at least for me on iOS. Always flip the top 3 first (even though their reward has already been added to your collection) before flipping the video card. If you recognize it as one of those ads, often in the lower left corner there’s a tiny symbol. Push that, a page will pop up for reporting the ad. Select a reason to report, done. Ad goes away, you get reward. Did they move the play off line option to level 2? I thought that was level 3. I couldn’t play this past weekend when the servers were down. As sure as God's got sandals. You'd think it'd be a breeze with basic, but it's so easy to lose the ball! I don't care what level it's at, 1 ball on Junk Yard suuuuuuuuuucks. Getting 5 and 10 stars, no problem. Getting 15 stars? I've done it before, but I can't even get close today for some reason. I'm usually fairly good at hit broadside, wash and repeat. My biggest issue is activating double broadside and then blowing past the goal and not seeing what the target score was. Today, I'm bricking shots left and right. I sent an email to Mel to pass along to whoever it is at Zen that is in charge of all the mobile nonsense, so it's possible changes are happening because of that? Or the more logical answer is Zen already had something in the works. I'm just keeping an eye out for the hard cap as I'm still earning parts for Safe Cracker and I'm still 45 coins away from upgrading. After 26 days of consistent data, on day 27 I noticed my totals were a bit unusual. 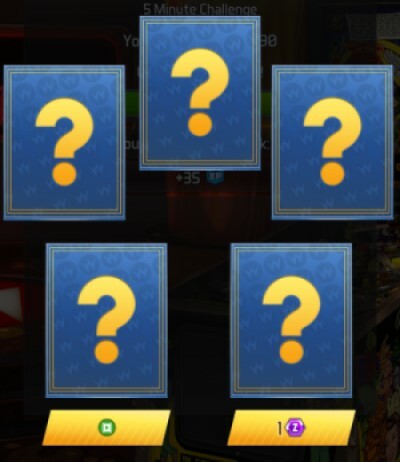 I had sent to Zen some analysis of all the data I'd collected so far, as well as some issues with the game like interactive ads that crashed the app and invisible cards in the Premium Challenge. The card thing seemed to be fixed, and the ads weren't crashing, so fixes seemed to have been made. Today, day 28, I'm getting the same data as yesterday. This is not good, folks. Let's start with table parts. You now earn 10 fewer per day. I'd be sorta okay with that if hard caps were in place, but they are not. The lower number mostly affects the Pro and Premium challenge, as gone are the +5 and +6 drops, +3 is the highest now. Tickets on the other hand have gone way up. Playing all 4 challenges, I was typically earning 600+ per day. These last two days, I earned 890 and 1080. That's all good for people needing to upgrade to level 3. Coins is where Zen has made a change that is messed up. I earned 3 yesterday and 3 today. I had been averaging 7. The 3 I earned today were for getting 10 stars in the Premium Challenge, nowhere else. If this holds, it will take 34 days to reach 100 coins. That means once the next Volume drops, even I won't be able to upgrade more than one table before the Volume after that arrives. In other words, a true Pay Wall will have been put in place. And with no hard cap on table parts, I'll be spinning my wheels same as everyone else by getting parts I no longer need because I can't afford to do the level 4 upgrade. I'm gonna continue to monitor this, but if I see this sticking I plan on raising hell. I've already started with a harsh Tweet, then there'll be the podcast. I've said it all along, I get that the freemium model is to entice you into hurrying things along by making purchases, but the one thing I can't stand is forcing you to in order to succeed. Zen needed to actually ease up on some things just so new users could have a fighting chance, and instead they're clamping down and shunning everyone. I'll start data logging again. Was earning tonnes of coins on Monday and thought I'd have Pro Physics unlocked by now, but I've only seen 2 or 3 since then. You're right about tickets, I dropped 6000 on a couple of promotions and I've already earned another 1880 out of thin air. Still an occasional bonus part here and there. Just cleared today's Basic/Advanced/Pro challenges in around 75 minutes and earned: 22 parts / 3 coins / 580 Tickets. Most of that time was wasted on AFM Pro 15 star, not worth the effort. Last edited by MBeeching; 04-18-2019 at 01:52 AM. I was just thinking about the coins and parts drop rates, at this point I only have one table fully unlocked. I'm thinking that when the next pack drops, I am going to need to just buy it outright - otherwise I don't really believe there is any chance I will be able to reasonably earn coins and parts fast enough to keep up with the release schedule. I play every day and clear multiple level 1 challenges and the level 2 challenge generally to 15 stars, but with parts dropping for 9 tables it's already spread too thin. I spent so much time on Champion Pub Pro 1 ball last night, just a stupid amount. I wanted to finish then rather than try again in the morning. Muscle memory had me making the same mistakes over and over. Can’t tell you how many times I had a 32 million purse for Knuckles O’Brian only to lose the ball almost immediately after starting fight. I truly hate that table now. You absolutely will need to purchase if fully unlocking is your goal. That’s the point I’m making, that even I with only one table left to upgrade and 60 coins collected, will now barely make that before Volume 4 presumably arrives. And I’m playing all 4 challenges to 15 stars daily. I was on pace to upgrade 7 days from now and then earn another 100 coins 14 after that to be in reserves. Now I’ll only be able to do 1 upgrade per release cycle. For all I know larger coin packs are hidden under the coin cards. If they are, they will consistently be behind the same card of a certain challenge goal. Identify that, it’d be worth spending the coin needed. I had planned on doing just that after the upgrade, but now?